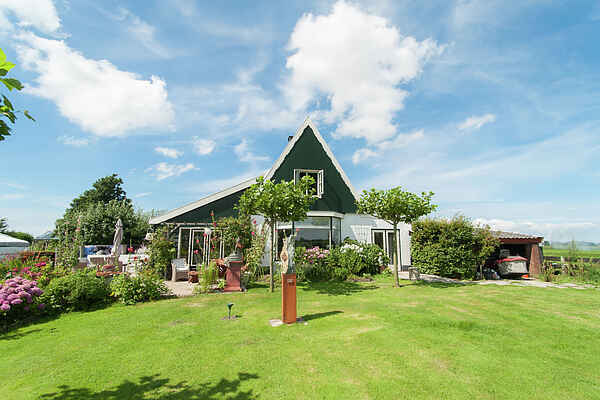 This luxurious miller's house is located next to the oldest mill in the Netherlands and is surrounded by beautiful bulb fields. Behind the house is the biggest duck decoy in the area in the shape of a large group of trees; this attracts many birds and is a wonderful place for birdwatchers. The house is tastefully decorated with worldly and creative influences that are reflected in the interior. The garden of the holiday home is a true paradise. From the Indonesian garden house, you can enjoy the fantastic view. There'a a trampoline, swings, a football field and more than enough space for the children to play. There also is a lovely patio for barbecuing. There even is a open fire in the garden where you can enjoy cosy evenings around the fire. You can go boating directly from the garden: this area is in fact ideal to explore by boat. From this wonderful place you can go to the beach in Callantsoog and the center of Schagen in half an hour by bike. You can visit the characteristic village of Oudesluis by boat. A day of swimming with the kids? There's an indoor pool at about ten kilometers distance. Do you love cheese? Then a trip to the Dutch Cheese Museum in Alkmaar is highly recommended!